A luxurious South African honeymoon safari with your new spouse will be one of the most memorable experiences you will share as you start your new life together. Africa can charm any traveller with its classic allure, natural splendour and crimson sunsets, which is why a holiday on this incredible continent promises unadulterated romance – and so much more – thanks to its iconic and authentic landscapes complemented by luxurious hospitality. Your first date on this tour will be at the breathtakingly beautiful and romantic Birkenhead House – an iconic showcase of South Africa’s finest hospitality, cuisine, wine and leisure. A chic and intimate coastal experience, Birkenhead House sits in the seaside town of Hermanus. With its exhilarating cliff-top position overlooking the whale watching paradise of Walker Bay, Birkenhead House is the perfect ‘love nest’ for newlyweds. After your stay at Birkenhead House the next stop on your ‘Out of Africa Honeymoon Safari’ is romantic, charming and alluring Cape Town where you will spend three nights at the sublime, luxurious, romantic and charming Ellerman House. Ellerman House sits perched on the slopes of Lion’s Head in the prestigious Bantry Bay residential area in Cape Town. Enjoy Cape Town and the Cape Peninsula (up to Cape Point), famous for scenic beauty, celebrity beaches, Table Mountain, whale-watching, world-class shopping, nightlife, food and wine, and a laid-back atmosphere. Your next stop on this tour will be at the exquisite Londolozi Private Granite Suites, situated in the game-rich Big 5 Sabi Sands Game Reserve, adjacent to Kruger National Park. The décor and design elements reflect the beautiful granite rocks which surround the camp while conveying the spirit of Africa. Game drives at Londolozi are run by professional rangers and trackers who are constantly on the lookout for fresh animal tracks in pursuit of elusive animals. After an incredible few days at Londolozi, our newlywed couple will commence their Out of Africa Honeymoon at the exquisite and luxurious Relais and Chateaux accredited- Zarafa Camp situated in the heart of the Okavango Delta where you will spend the next three nights. Overlooking the crystal waters of Zibadianja Lagoon, the source of the famous Savute Channel, every area of the camp has a magnificent view. The lagoon is also the water source for a tremendous population of wildlife – dry season sightings boast buffalo and elephant by the hundreds. After an amazing three nights spent at Zarafa Camp, this tour will see you calling the majestic Royal Livingstone Hotel in Zambia ‘home’ for three nights. Situated on the banks of the Zambezi River, The Royal Livingstone Hotel is named after the legendary explorer who named Zambia’s iconic waterfall in honour of his queen and is characterised by colonial luxury and majestic views. Paying tribute to this glorious era, this hotel evokes Victorian elegance and colonial traditions in impeccable style, offering unforgettable adventures. 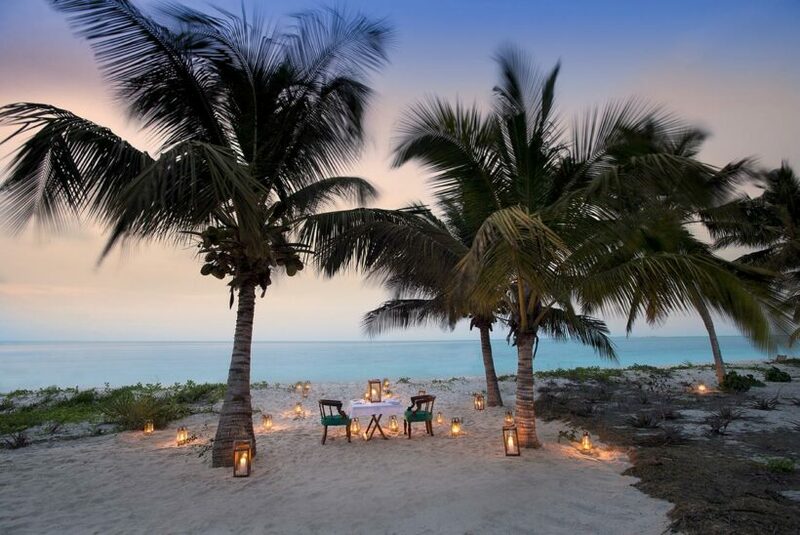 For the last leg of this incredible honeymoon, our honeymoon couple will fly to the idyllic Benguerra Island Resort, where they will spend a magical 4 nights. Situated on the second largest island in the sunny Bazaruto Archipelago, the lodge offers pristine beaches and unspoiled coral reefs teeming with marine life. Looking out onto a sandy beach and set on a deep lagoon unaffected by the tides. An exquisite piece of paradise in the middle of the Indian Ocean, &Beyond Benguerra Island is a luxury beach holiday destination where time stands still and legends come to life. You commence your honeymoon of a lifetime being escorted to the romantic, breathtakingly beautiful Birkenhead House, where you will spend the next two nights in pure romance, relaxation and tranquillity. Spa, pool and gym offer the chance for indulgence, relaxation or exercise. Cliff and beach walks are an invigorating way to take in the air but numerous sporting and leisure activities are available in the area, from golf to shark-cage diving. Whale watching, for which Hermanus is famed, can be done from the hotel from June to November, with September the height of the season. After a relaxing two nights at Birkenhead house, the newlywed couple will be transferred to the exquisite Ellerman House where you will spend the next three nights in pure bliss, surrounded by breath taking scenery. Ellerman House is the quintessential urban retreat for discerning luxury travellers wanting complete exclusivity in Cape Town. Located in Bantry Bay, the small, privately owned hotel offers spectacular Atlantic Ocean views against the dramatic backdrop of Lion’s Head. There are 13 individually decorated rooms and suites complemented by two ultra-modern villas. The natural splendour of the hotel’s unique location is matched by generous-hearted South African hospitality, exceptional cuisine that reflects the best of local and seasonal flavours, and a vast collection of local vintage wines. A resident sommelier offers private tastings and wine pairings to complement a daily menu of modern classics. Guest privacy is a top priority in this exclusive environment, and the hospitality team prides itself on individualising every aspect of the experience and tailor-making excursions. Spend three days discovering beautiful Cape Town and the Cape region as well as two scheduled full-day tours of the Cape Peninsula and the Cape Winelands. A fascinating township and Robben island tour can be arranged at guest’s requests. After feasting your eyes on the sublime beauty that Cape Town has to offer, today you will fly to one of the most beautiful places on earth, Londolozi Private Granite Suites, your home for the next three nights. A short, shared chartered flight from Londolozi to Johannesburg, will connect you to your scheduled flight to Maun, Botswana, from there you will board your final chartered flight of the day to one of our favourite and most distinguished lodges, the Relais and Chateaux accredited Zarafa Camp in the Okavango Delta, your home for the next three nights. This is where Dereck and Beverly Joubert, co-founders of Great Plains Conservation, lay their weary heads many long years ago, exhausted from filming. The tranquillity they found as they slept under the tree stayed with them, and a decade and a half later, having raised enough money to begin their Great Plains journey, the magnificent ebony became the focal point of a camp whose name had a fascinating journey all of its own… Zarafa. Just four magnificent tented villas and a spectacular main area, all raised on decking to take advantage of views over the lagoon, reflect the desire for exclusivity and privacy which inspired Zarafa’s design. Guests can while away free hours in their private lounge and soak in their private plunge pools before savouring mouth-watering meals in the elegant dining area or on in the dappled shade of the deck. Adventures include morning and evening game drives in open 4×4 safari vehicles, short guided walks, and the opportunity to get up close and personal with wildlife at the pontoon. We know it’s hard to say goodbye to such an incredible haven of luxury and tranquillity, however, this morning our newlywed couple sets off to one of the seven wonders of the world, the majestic Victoria Falls. The stunningly beautiful The Royal Livingstone Hotel is where they will be spending their next memorable three nights. On the banks of the Zambezi River, The Royal Livingstone Hotel is named after the legendary explorer who named Zambia’s iconic waterfall in honour of his queen. Paying tribute to this glorious era, this hotel evokes Victorian elegance and colonial traditions in impeccable style, and offers unforgettable adventures. The Royal Livingstone Hotel comprises 173 spacious en-suite guestrooms, each with its own private veranda, stretched along the river bank. All luxury rooms and suites feature a private veranda with mighty Zambezi River views. The sights and sounds of river life can be soaked up as you laze in a hammock, enjoy a massage in a waterfront gazebo, or cool off in the pool. Sip refreshments in a lounge that displays the paintings of Sir David Livingstone. Partake in charming high tea rituals, and later sundowners on a deck overlooking Victoria Falls. Savour African and European fine dining, followed by nightcaps under the stars with undeniably the finest Livingstone hotel in the region. Make the very most of their extraordinary destination with trips of a lifetime. The Big Five can be spotted on a river cruise or a 4×4 safari. The rapids of Batoka Gorge offer adrenalin pumping thrills. The Royal Livingstone Express steam locomotive invites you to travel in vintage style along one of Southern Africa’s most scenic railway passes. While as a guest of The Royal Livingstone Victoria Falls Zambia, you enjoy the privilege of complimentary access to Victoria Falls via the hotel’s private entrance. Today you will fly to paradise! Our honeymoon couple will fly to Vilanculos via Johannesburg, this is followed by a short helicopter transfer to the idyllic Benguerra Island Resort, where you will spend a magical 4 nights. Situated on the second largest island in the sunny Bazaruto Archipelago off the coast of Mozambique, the lodge is set in a protected marine conservation area and offers pristine beaches and unspoiled coral reefs teeming with marine life. Looking out onto a sandy beach and set on a deep lagoon unaffected by the tides, this exclusive beach getaway is ideal for swimming and snorkelling. Surrounded by premier diving sites, the lodge is the gateway to an underwater wonderland for divers, with a rich variety of tropical fish species complemented by Africa’s only population of the rare dugong. The deep Mozambique Channel, which runs alongside the island, is renowned for its game fish and Benguerra Island offers some of the world’s best catch-and-release deep sea fishing and fly-fishing opportunities. All good things must come to an end, but not without unforgettable memories made for a lifetime to remember. After a succulent breakfast, you will fly back to Johannesburg, from where you will start your journey back home and start planning your next African Safari!